A 48 hour bandh called by the agitating lawyers demanding high Court bench in western Odisha completely paralysed normal life in several parts of the region today. Business establishments ,educational institutions and government offices were closed while vehicles were off the road in sambalpur, Jharauguda, Deogarhand, Sundargarh districts on the first day of the 48 hour Mahabandh. People cutting across party lines joined the advocates to support the demand for a high court bench in Sambalpur. 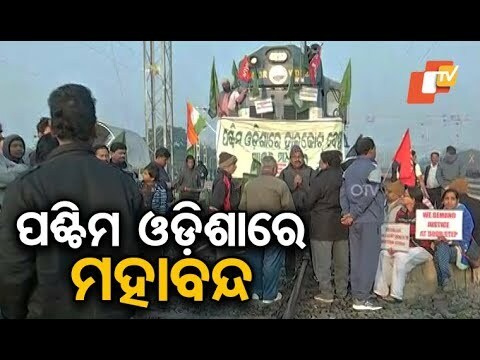 The MLA of Sambalpur Dr. Raseswari Panigrahi also joined the agitation in Sambalpur station to extend the support of her party for the high court bench. The agitating advocates resorted to picketing before all important entry points of the city to stop movements of the heavy vehicles as a result hundreds of heavy vehicle were seen stranding standing on road The movement of the trains was also obstructed at all the three stations of the city forcing the railway authority to cancel and divert several trains. Massive police forces were deployed in all places of the district to prevent any untoward situation.